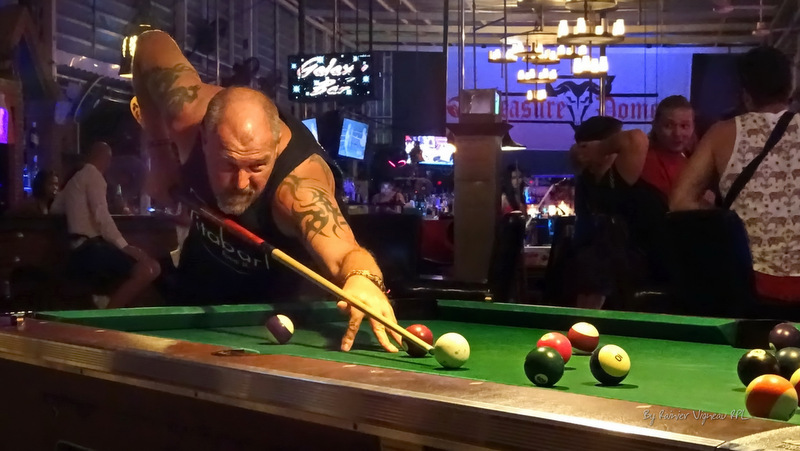 POOL: An incredible Monday night (Dec 3) in the Rawai Pool League saw the race for the title blown wide open. Reigning champions White Hart destroyed current league-leaders Black Sheep in a top class contest. Rob got things going for White Hart, clearing up after Nanni’s dry break. Nanni, unbeaten this season with 17 wins in a row, had ball-in-hand in the second frame after a foul by Rob. Normally Nanni’s opponent would sit down, have a drink and enjoy the show but upon opening the balls, Nanni fouled letting Rob in to clear up. Dum faced Black Sheep’s Goh in a tense battle of the top Thai players. Dum came out on top in a thrilling deciding frame giving White Hart a 2-0 lead and leaving Black Sheep in disarray. Kevin is finding his form again after his French hiatus and took an early lead in his match, but Phil E eased White Hart into a 3-1 lead to leave Black Sheep hanging on by a woollen thread. Ricky and Kevin went one frame up in their doubles to give Black Sheep hope, but Ricky then potted the black out-of-turn in the second frame. Rob and Dum won the deciding frame giving White Hart an unassailable 4-1 lead. The blues continued for Black Sheep, with White Hart capping off a terrific 6-1 win. Shot Bar took full advantage of Black Sheep’s defeat with a 6-1 home-win against Freedom Bar. Once again, Freedom salvaged the Beer Leg, which has become their specialist subject. Shot Bar now trail Black Sheep by leg difference only. Future Bar went into a 3-0 lead against Tropical Sands but Jason, resembling Mr Bean in looks and style of play, produced a delightful comedy of errors to start the visitor’s revival. Still reeling from the previous night’s derby defeat, Jason’s rendition of You’ll Never Walk Alone did enough to put off Everton fan Wayne. Jason further played to the crowd by potting the black with his cueing arm behind his back. Tropical Sands’ narrowed the gap with Jason and fellow Aberdonian Craig outplaying Otis and Fod in the first doubles. Future Bar Superstar Barry teamed up with fellow Evertonian Wayne to put the game to bed and undo some of the Derby-night injustice. Fod scratched on his team’s last ball in the deciding Beer Leg frame to give Tropical Sands consolation in Future Bar’s 4-3 win. In the Rawai Arm-Wrestling League, Fuzz (who worships Over The Top) retained his unbeaten run against Barry. It was a scrappy affair for Pita Bar, who hosted close-rivals Mango Bar. Without some regular players, Mango managed to hold Pita at 2-2 in the singles. Stefan’s good form to win 2-0 against Gregg stood out. The doubles matches were also shared evenly with both teams winning without a response from the opposing side. Pita then moved into higher gear and produced a good team effort to score 2-0 in the Beer Leg and take the match points. Pita stays fourth from the top, while Mango drops one place to sixth. Black Pearl visited Masaya Bar without dropping a single frame in the singles and doubles. Grega returned to produce a stunning performance against Masaya’s Marcus, but questions remain on whether he will ever regain his superstar status. The place erupted when Masaya finally won a frame in the Beer Leg. The 0-7 loss leaves Masaya Bar perilously close to the relegation zone. Despite improvements in recent weeks with the arrival of Rainer, the all-French Orange bar remain winless with four games to go after a 4-3 defeat away to Spot Bar on the beer leg decider. Orange Bar is now guaranteed action in the B Division next season. Roses Bar is still undefeated on their march to the Division B title. They had an early scare though when Islander A’s Andy M beat Noom, but order was restored with Roses taking the remaining singles legs. Islander A stayed in contention with doubles win where Jon and Paul provided an electrifying performance, but it was lights out when Roses won the remaining legs to take the match 5-2. Black Bull maintain their promotion charge with another good win over the all-girl Pink Sheep. The girls restrained Black Bull to 2-2 in the singles, but the girls were unable to hold on in the doubles, which both went to the guys. With the final score 5-2, it looks ever more likely that Black Bull will join Division A next season. Islander B welcomed White Hart BBQ in a follow-up to their recent derby Friday night matches. Islander owner Mark can’t seem to rally his players, no matter how young and handsome his trio of teammates are. Only Terry’s close win against White Hart’s Friedhelm prevented a whitewash in the singles games. The match result was sealed when honours were shared in the doubles and White Hart BBQ went on to win the Beer Leg and close the night 2-5 victors. Moonlight Bar travelled up from the beach to face rivals Baroque at Laguna. In what was the night’s most emphatic win, Moonlight whitewashed their opponents with a match-winning 0-4 scoreline. Baroque managed consolation wins in both doubles, while the Beer Leg went to the victors. Final score Baroque 2, Moonlight 5. It was also a good night for The Stoned Crab who managed to stem a recent run of loses with their visit to Kilt’n Haggis. The singles gave the visitors a commanding 1-3 lead, and the match result was confirmed when John O and Sam won against Kilt-owner Graham and Nut in their doubles game. The Beer Leg went to the Haggis, leaving a final score Kilt 3, Stoned Crab 4. O’s Bar only managed to win the beer leg against second-placed Stor Bar. Stor are now ensured promotion to the top Division with their 6-1 win despite closely fought frames all night.